Folk blouses are some of the best Romanian souvenirs to take home. Romania can be divided into approximately 7 major ethnographic regions. It is from these regions and their villages that the variety of folk blouses is generated. The more you look within the same ethnographic zone and, sometimes, within a single village, the more likely it is you will find an abundance of different structures and patterns. On the other hand, if you can’t tell the difference between an original handicraft and a fake, you should only buy from a trustworthy source. As an advice, just stay away from hypermarkets, clothing shops, souvenir stalls, even from large or small souvenir shops, unless you are sure they are selling authentic items. Instead, headover to the local ethnographic museums. Other than traditional blouses, there is a great diversity of utilitarian weavings and embroidery to choose from. Authentic rugs, blankets and tapestry are worth buying, especially the vintage ones, made of organic materials and vegetable tanned. There is a great diversity on offer, specific to each ethnographic area. Oltenia stands out with it’s geometric patterns and vibrant colors. The second half of the 20th century introduced a new influence in Bukovina: colorful rugs with big flowers, very different than the traditional geometric patterns from the XIXth century. It is worth mentioning the rugs from Maramureş, Transylvania, with geometric or human shapes. There are lots of folk inspired rugs in the market today. Whether industrially, machine made, or by use of new techniques, other than the traditional ones, my fair opinion is the original will keep or even grow it’s value with time, while a replica won’t. So pick an original rug rather than a replica and, even after decades, you will sell it for at least the same price. The traditional towels are worth taking home for both utilitarian and decorative needs. Traditionally, the towels are used for display, gifts, dowry, or personal use. The more complex the patterns, the more valuable it is. While the beautifully painted dowries and chest boxes might be too large to take home with you, carved spoons, wooden containers, or a small dish shelf can fit in your luggage. Big ladles, mainly used for cheesemaking in the traditional sheepfolds, are also worth mentioned for their resistance and value. At a close inspection, you can tell if the object is handmade. Just stay away from lacquered wood carvings, because lacquered wood doesn’t breath. There are ways of finishing wood better than lacque covering. 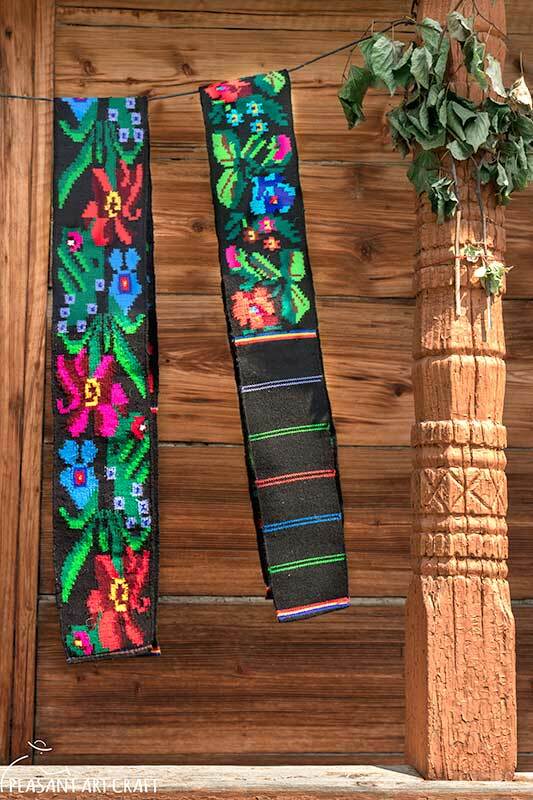 While folk inspired shoes, purses and wallets are a new trend, which started about 3 years back, I’d like to draw your attention to the original leather handicrafts of Romania, including peasant sandals and traditional waist belts. 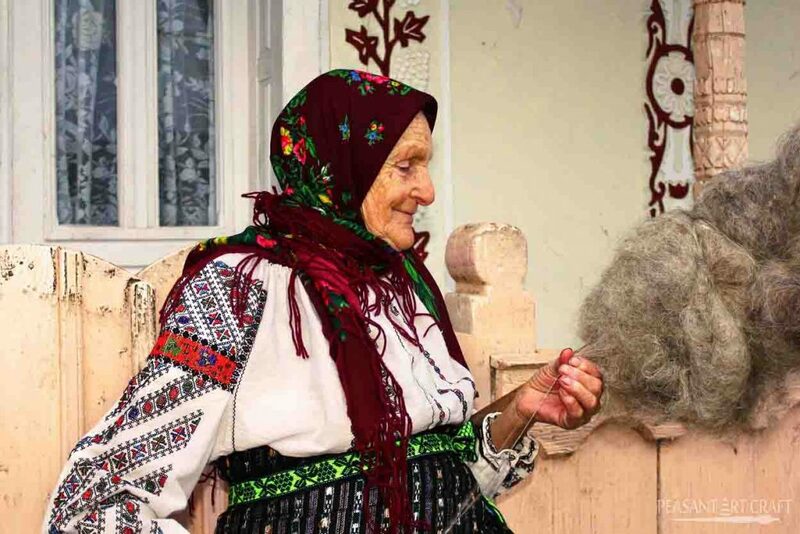 Making straw hats is a traditional craft still alive in many regions of Romania. Straw hats from Maramureş (Clop de oşan) will make excellent budget gifts for your friends and family. A straw hat costs as little as $3, and no more than $5. Traditional ornaments have always been worn with the Romanian folk costumes. During the late 19th century, colorful beaded necklaces, bracelets and earrings had replaced the ancient coin jewellery. These eye catching jewellery are excellent gift ideas when you’re on a budget. Romania is famous for producing quality ceramics at good prices. However, there are Chinese imports in the market, so here are 5 trusted Romanian pottery workshops to visit.